MRZ: My own process, in which I began to shift from a liberal to a leftist, from a Zionist to a non-Zionist, from someone who generally believed Official State narratives to someone who generally rejects them, and from someone who wanted to join the IDF and be a “good soldier” to someone who ultimately refused to enlist, began during “Operation Cast Lead,” almost six years ago. This was, in part, because of stories, including the story of the two brothers of one of my classmates at Middlebury College who were shot “by accident” by Israeli soldiers as they left their farm in the Gaza Strip, and then left to bleed to death as the army forbid an ambulance from getting to them. But in addition to the stories, it was also the numbers: Israel had killed so many people- many of them children- in such a short period of time. I did not want to believe that the Israeli government and army acted with blatant, callous, cruel disregard towards Palestinian civilians, but that it is ultimately what I came to believe, in part thanks to Israeli journalists and writers who were brave enough to speak out against what was happening. And if I am honest with myself: It’s not that these Israelis were saying things that Palestinian journalists and writers were not saying. It’s that they were Israeli Jews. I am not proud of this, but I acknowledge it, and it is with this in mind that I decided to translate a piece on the first four days of this recent Gaza “war” by Israeli blogger Idan Landau, a Professor of Linguistics at Ben Gurion University. The Hebrew original can be found on his blog, לא למות טיפש, or, Don’t Die Dumb, which I cannot recommend highly enough for those of you who speak Hebrew. For those who do not, here is my translation of one of Idan’s pieces on the recent situation in Gaza. Idan Landau. July 11th, 2014. A riddle: If we are so right, if every one of the air strikes on Gaza is a solid rock of morality, if the residents of Gaza deserve all that they are getting- then why are the facts being concealed from us in the Israeli media? Why don’t they tell us what the entire world can find out with the click of a button? Thus looks the Israeli media over the past four days. No one is surprised- at least no one who was here during “Operations Cast Lead” and “Operation Pillar of Defense.” Experience has proven that the silencing works. Israelis truly do not know what is going on, and from this we can extrapolate that they are also not in a rush to find out. They are good with not knowing. Which brings us back to the riddle: why are they concealing the facts? Why does he who is “right” insist on shutting his eyes? In situations such as this one, the least that decent Israelis can do is speak the truth. To report, to spread information, to slightly reduce the veil of ignorance and insensitivity. In times like these, documentation is the Left’s most urgent mission. A note of warning: if the reality in Gaza does not interest you, do not read on. Also, do not try to explain to me why the reality in Gaza does not interest you; people who are not interested in facts are not interesting to me. If “difficult” pictures of suffering on the other side are beyond what you can handle (and the images that appear in this post are relatively gentle compared to what is running online)- do not keep looking. And if you think that the real story is the messenger (the Left) and not the message, also then: save yourself the effort. In Gaza, a massacre is going on. We can now use this word without quotation marks, without caution, because the hard facts will not reverse themselves. 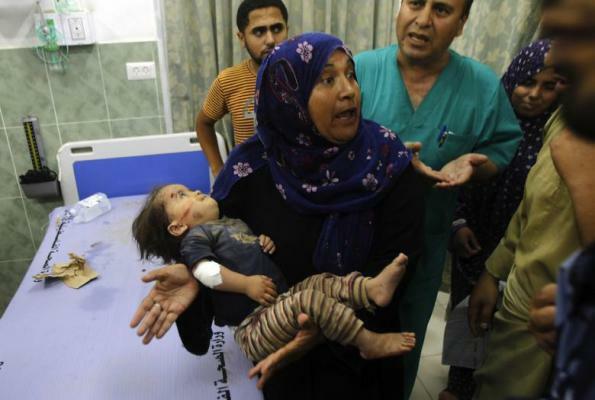 As of end of the fourth day of the operation, 105 people were killed and 785 injured in Gaza. This is twice the number of deaths and during the first days of “Operation Pillar of Defense” [in the Fall of 2012]. But the incredible fact is the high percentage of uninvolved persons killed… The last report by the UN spoke of 58 out of 80, and the last report by the Palestinian Center for Human Rights spoke of 73 out of 86. In other words, the percentage of innocents killed fluctuates between 72%-84%. For the sake of comparison, in the first four “delicate” days of “Operation Pillar of Defense,” the percentage of uninvolved persons killed was 35%. The IDF’s “Collateral Damage.” Photo: AFP. 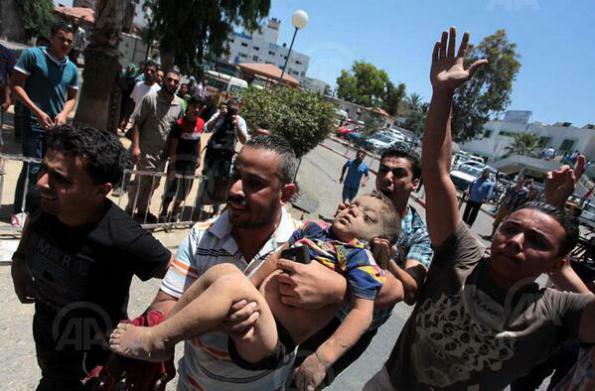 And so, again, an Israeli massacre in Gaza, this time quicker and crueler than before. The damage to property is already estimated at thousands of houses. As in the past, Israel does not spare hospitals and medical clinics, which are now needed more by the residents of Gaza than ever. The European hospital in Khan Yunis was shelled and 17 people inside it were injured. The plaster ceilings in the ICU, the children’s unit, at the entrance to the hospital and in the waiting room collapsed. A clinic belonging to the volunteer organization, PMRS, was severely damaged during a shelling of Khan Yunis. Similarly, the Red Crescent’s clinic in Jabaliya was shelled; 15 staff members were wounded and two ambulances were destroyed. Al-Wafa Hospital has already been hit by a “warning missile” and is in the crosshairs. These basic facts are not known by most media consumers in Israel. The Israeli media stuffs its consumers with pictures of children drawing in the bomb shelter and citizens casting their eyes towards the missile interceptions in the sky, while sparing them any unpleasant image from the other side. The fact that only readers of Haaretz even receive constant updates on the number of people killed on the other side proves that most of the Israeli media acts as a branch of the IDF Spokesperson’s Office. One incident that did seep into the media was the murder of eight members of the Kaware family in Khan Yunis, as “punishment” for their familiar relation to Oudeh Kaware, a Hamas member. On July 8th the IDF struck this house with a “warning missle” -a light missile that is shot that the roof of the building to warn that it is going to be shelled- at 2:50 PM, and at 3:00 PM a missile was shot at the building from an F-16. Six children were among those killed. The members of the house chose not to evacuate, despite the warning: this was known by the pictures taken by the UAV. (If so, shrug the shoulders of the average Israeli, their blood is on their own hands, including Siraj and Bassem, who were 8 and 10 years old). The IDF claimed that it was already impossible to divert the missile from its path. This is a dubious claim, which seems to imply that it takes a missile 10 minutes from the moment it is launched from a plane until it strikes its target. The apparent conclusion is that someone pressed a deadly button with the knowledge that it would kill innocents. The IDF’s “Collateral Damage”. Photo: Anadolu. An additional incident took place in Beit Hanoun on July 8th. The house of Islamic Jihad member Hafez Hamad was shelled (without warning) before midnight, as the members of the household were going to bed; aside from Hamad, five other people were killed, including a 16 year-old girl. On July 9th, in the afternoon, an Israeli missile split the Nawasrah family’s home in half, in Magazi, killing Salah Nawasrah, his pregnant wife, Aisha, and his two nephews, Nidal, 4 years-old, and Mohammad, a two-year old toddler. Mohammad’s head was blown off and later found in the yard. On July 10th at 1:25 AM, a missile hit the Al-Haj family in Khan Yunis, killing Yasser Al-Haj, a member of Hamas, and also his father, Mohammad (58), his brother’s Said (17) and Tarek (19) and his sister Asmaa (22). Two additional young family members, and another brother (Omar, 20) were killed, apparently buried beneath the rubble. On July 10th at 11:30 AM, nine Palestinians sat on the beach in Khan Yunis to watch the World Cup game between Holland and Argentina. An Israeli missile penetrated the straw roof of the cafe, and killed seven people on the spot: Mohammad Fawana, brothers Ahmed and Suleiman Astal (16 and 18), brothers Mohammad and Ibrahim Ganan (24 and 25) and brothers Hamdi and Ibrahim Sawaleh (20 and 28). Israeli politicians and analysts are competing with each other to see who can offer more praise for the “restraint” coming from the State level and the admirable “restraint” coming from the Air Force, and, of course, the “surgical accuracy” of the strikes themselves. This fantasy world can continue to exist only because it remains unchallenged by the bloody facts from Gaza; and it remains unchallenged because the public arm that is trusted to report, the media, is abusing its role and failing in its task. If there is a single perfect example of treachery in times of war, this is it. Here and there, a different message sprouts up, a message that was told to the soldiers and not supposed to arrive to us, the public, strange words about an “enemy that blasphemes God’s name.” These words will be swept quickly under the rug, and in their place, we will return to the discourse about “restraint,” about surgical strikes. Which brings us back to the riddle: if everything is so good and so right, why are they hiding the truth from us? Why does a Member of Knesset lose his temper when faced with the facts and demand (!) that the television stop reporting them? The Israeli society has Been damaged beyond repairs from the constant lies and deception by the Zionist founders and the Holocaust politicians mentality . Till there is a clear rebuilding of this society with humanitarian values and sense of being part of the world like all others, the disease will persist and ferment ! Truth is always the first casualty of war. And this truly is war. Netanyahu declared war on Hamas, using the pretext of the unexplained abuduction and killing of 3 yeshiva students. But what really drove him along this path was when Fatah and Hamas declared their intention of forming a coalition unity government. The idea of Palestinian unity was enough to drive Netayahu further into the lunatic asylum he occupies in Tel Aviv and he could hardly wait for any pretext he could find to declare war on Hamas and the Palestinians for having the sheer audacity of creating a unity government. Let no one forget that what preceded the war on Gaza was an all out attack on Palestinians in the West Bank under the pretext of finding the abducted 3 yeshiva students while – all the while – Netayahu knew they were already dead and hid this fact from the entire world. While people are distracted by the ceaseless attacks against the Gazans, Netanyahu and his Zionist thugs are also – quietly and calmly – waging all-out war in the West Bank too. I think your web site is under cyber-attack – by guess who? You have asked Firefox to connect securely to thelefternwall.com, but we can’t confirm that your connection is secure. This problem may be unique to Firefox but you might want to talk to your internet service provider about this problem and ways of dealing with it. This is what always happens when anyone upsets the IDF hasbara propaganda unit.